More Indians are using smart lighting to make a statement in their homes. These practical, clever and inspiring ideas can create amazing colourful displays for all types of events at any budget. As smart lights and smart home technology becomes more widely available in India, people are still asking what the real value is. Those people probably haven’t seen someone turning their light bulb to any of three million colours by using a simple smartphone app. With a few bulbs, strips of LED lights or stylish lamps, an entire house can dance and pulse with colour. Or, you can use an app to create dramatic themes and shimmering effects or artistic looks to impress visitors. With colour such a key part of Indian culture, one of the first smart items many people are trying out is a colour light bulb. Special occasions like Diwali are perfect times to use smart lights, and what better than the festival of lights to experiment with innovative lighting and some clever home decor, that’s easy for anyone to setup. Any Indian festival, such as Diwali, is a colourful experience. While they may be rooted in tradition, there is no reason that a little modern touch can’t be used to add to the experience. Smart lights can be set to glow, change colours and pulse in a huge variety of shades, bringing some of the festival experience indoors. Those effects can also be used when children are having a birthday party or a get together. Having a karaoke night or a house party? Some smart bulbs are available with microphones in them so they can pulse in sync to the music. 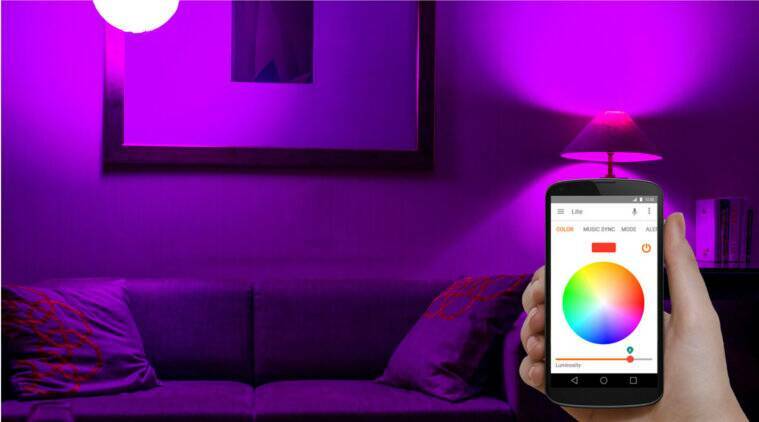 You don’t need an extravagant budget to invest in smart lights, individual bulbs cost from Rs. 3,299 that are controlled directly by a smartphone app, while you can get a Philips Hue which uses a hub to control many lights throughout the home if you want a state of the art smart home experience. All of these products are now widely available and accessible to the mainstream consumer, as they are easy to buy online, to set up and use they are no longer just for gadget lovers. Indian homes are by nature bright and colourful, and smart lights can help add to the ambiance, whatever your personal mood. If you want to relax in the evening, they can provide a wide range of calming, restful levels of white light to bring a peaceful end to your day. During IPL season, you can set the smart lights in the room to match your team’s colours and personalise the atmosphere. If they are sound activated, apps can change the bulbs depending on the audio or scene on the TV, they can flash wildly when a six is hit or a wicket is taken to bring a little of that stadium atmosphere to your home. If you want a romantic dinner, then they can be set low, with warm emotional hues fading in and out to create that by-the-fire or by-the-beach feel to set the right mood for your date. Or, if you go to the other extreme they can help a kids slumber party with some spooky lighting for story time and then a gently darkening light to help get them off to sleep. These are just some examples of what can be achieved with a single smart bulb, all the way up to a house loaded with LED strip or smart lamps designed just to set the right tone or mood. The modern trappings of the smart home are coming to India quickly now, and our homes can lighten up the different moods of our festive season with smart lighting. It doesn’t take a technology genius to use them, and they can benefit both the young and old. These LED smart lights are also low power, so will save on your electricity bill, last for many years of use and can help provide many nights of entertainment and fun as part of your smart lifestyle, making them so much more impressive and fun than a regular bulb.